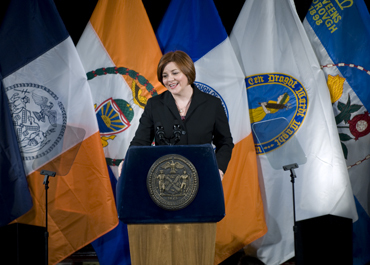 In her State of the City address this afternoon, City Council Speaker Christine Quinn laid out her priorities for the year ahead. Her speech focused on four issue areas: balancing the city budget, creating jobs, preserving affordable housing and parking. Quinn’s parking platform isn’t aimed at making parking cheaper or more plentiful — though she’s taken action on that front recently — so much as eliminating some of the inconveniences car owners face when they park on public streets. To that end, she’s drawing on ideas like Brad Lander’s call to reduce the number of alternate side parking days on the city’s cleanest streets. While the Council seems poised to advance important bills opening up data on traffic safety, Quinn’s transportation platform for the year only provides benefits to a privileged minority of New Yorkers. In a high-profile moment as she gears up for a 2013 mayoral run, Quinn offered nothing to the 54 percent of households which don’t own a car. We’ve taken on everything from potholes to bedbugs, noise complaints to stalled construction sites. This year we’ll focus on an issue that plagues New Yorkers in many neighborhoods – parking. Look, we still want to get more folks out of their cars and onto public transit. But for families in many neighborhoods, that’s simply not an option. So under the leadership of Transportation Committee Chair Jimmy Vacca, we’ll pass a package of legislation to make their lives a little easier. First, we’ll take simple steps to free up additional parking space. For example, many blocks have more than one day of alternate side parking restrictions. Cars have to clear the way for street sweepers, even if the street isn’t dirty. We’ll change the law, so areas that receive the highest cleanliness rating for two years in a row will have the option of one less day of alternate side. We’ll also help you find out where you can and can’t park – before you get a ticket. We’ll pass legislation sponsored by Council Member Dan Garodnick creating an interactive online map. It’ll show what blocks are closed for filming, construction, or street fairs – and where parkingrules have temporarily changed. Making it easier to park is only part of the equation. We’re also going to take on drivers’ biggest complaint – unfair tickets. Ticketing is supposed to help us enforce the law – not help the city make a quick buck. But almost every New Yorker has a story about getting tickets they clearly didn’t deserve. Here’s one that’s especially infuriating. Have you ever parked your car, then gone to the munimeter to pay – only to come back and find an agent is writing you a ticket? And when you complain, they say they’re not allowed to cancel a ticket once they started writing it – and you’ll have to fight it in court. This is bureaucratic red tape at its absolute worst – the stuff that makes New Yorkers think government is just out to nickel and dime them. We’re going to pass a bill sponsored by Council Member Jim Gennaro, so if you show your receipt to the agent, they have to tear up your ticket on the spot. These problems may seem small – after all, searching for a parking spot can be frustrating, but it’s hardly a matter of life and death. But when you stop to think about it, you realize most problems seem small – until they happen to you. A 65 dollar parking ticket seems like a small problem – until it makes you 65 dollars short on the rent. Looks like my vote in the mayoral primary will be going to Stringer. When evaluating candidates for Mayor, NYers shouldn’t forget what Quinn has done: overturning term-limits against the will of the people; allocating millions of dollars to fake charities and doling them out in exchange for political favors; using over 30 city employees to collect signatures to put her on the ballot in 2009; having the worst human rights voting record of all Manhattan Council members; blocking every meaningful animal protection bill at City Hall, accepting millions of dollars from real estate developers after promising on the record not to accept any money from them; making a back room deal with the NYPD to curb NYers freedom of assembly, using millions of dollars of discretionary funds to control votes; killing several bills that have a veto-proof majority in the Council because they don’t suit her political agenda. are you saying all car-owners are rich yacht owners? i honestly don’t see anything wrong with what Quinn is saying here. although I agree with Donny Moss, there are plenty of awful things she has done and she should be no where near the mayor’s office. Christine Quinn is a political genius and 21st century leader. Quinn: “[A]lmost every New Yorker has a story about getting tickets they clearly didn’t deserve.” Really? I’ve lived here for 42 years and have gotten a handful of parking tickets (as a car-owner in the ’70s and ’80s; occasional car-renter since then). I deserved every one. Quinn’s proposals are not going to make driver’s happy. There is no way to make drivers happy in New York City. You have half the city with two-thirds of the housing units and 80% of the jobs built before the advent of mass automobile ownership. Virtually all available space has been turned over to motor vehicles and it still isn’t enough. Most of the remaining half of the city, the suburban parts where a minority of New Yorkers live, was built before the advent of the ownership of multiple automobiles per household. So even with most housing units having a parking space, it isn’t enough. Tens of thousands of people, particularly in younger generations, desperately want to live in NYC — most can’t afford it — because it is a place where the car isn’t needed. Most people who insist on driving, meanwhile, have moved on to places that accomodate their lifestyle. Some refuse, and complain. And others drive in from elsewhere, and complain. Streetsblog (any by that, I mean the greater ‘progressive’ activist community) needs to be better at controlling messages in the media. HOT lanes in many places have been called ‘Lexus Lanes’ in the media, casting them as benefits for the rich while the middle class gets screwed. Vacca, Quinn, et al have made vehicle issues a ‘middle class’ issue; successfully painting transit users as poor leeches and bicyclists and walkers as rich dilettantes, despite in fact that drivers are a minority AND impose the biggest costs; this viewpoint is completely missing in the media (as the ‘bike bedlam’ series et al prove). So, although the message is right, how does that get translated into populist opinion? This statement is not even remotely true. If some streets don’t need to be cleaned twice a week, then only clean them once a week. Seems like good budgeting, with a bonus side-effect for car owners. If you can prove to an officer that you have a valid parking receipt from the Muni meter, they don’t have to finish writing the ticket. (I have no problem with that, though it could be an invitation for bribes). An online database showing where parking is suspended? Seems like a generally good idea anyway – and may lead to people taking transit more often, rather than getting frustrated about not being able to park once they arrive. I’m no apologist or big fan of hers, but I see nothing here to get upset about. This stuff is all fine. But can we nudge parking rates toward the market price, eliminate the silly five-minute “grace” period, and figure out a way to stop people from parking eight feet from the fire hydrant in front of my house? Actually, its the Streetsblog/TA advocacy community that has accidentally managed to make driving “middle class” in New York City. What you all forget over and over again is that the public’s sense of class distinction has nothing to do with income, it has to do with perception and values. Hence a construction worker with a 80,000+ income thinks his SUV is appropriate for his middle class lifestyle while viewing the average lefty-progressive not-for profiter at Streetsblog as a wealthy elitist. Unfortunatly, sustainable transportation advocates have managed to mangle this issue into a misquided values conversation. On those grounds, we all loose. This post is proof positive of how far off the rails (pun intended) Streetsblog has gone. Is there anything in Quinn’s proposal that hurts biker or pedestrians? Anything that conflicts with a progressive streets agenda? Aren’t we supposed to be advocated a shared road? When we set up this conversation as “either-or” we doom ourselves to failure. And you can waste your votes on Scott Stringer to your heart’s delight. The sad fact is that by making this a values based (my transpo method is better for manking than yours) instead of a practicality argument, we’ve created a backlash that will set back this movement in NYC by many years. I was just commenting on her last sentence which implies that the typical person who this proposal was meant to help is someone for whom the $65 parking ticket would be the difference between paying their rent and being evicted. In fact, I’m pretty sure that you’d find a pretty good correlation with car-ownership and home-ownership (just guessing), and if the $65 were going to make or break you, you might want to consider selling your car before getting evicted from your home. I actually respect Christine Quinn (She did shepherd through the home rule message on congestion pricing), and think these proposals are reasonable. Just stop painting car owners as poor and somehow deserving of charity. I like your focus on practicality. Let’s focus on that then: If I get run over by someone distracted by their smart phone using the city’s parking map software, how is that practical? If ticket cop has to argue with every person who is getting an “unfair” ticket, how is that practical? If streets that are cleanest get cleaned less – doesn’t that make them dirty? Furthermore, do the dirtiest streets get less side parking and more cleaning? I would actually say alot of her ideas are impractical. Progressive Person, I agree that Quinn’s parking proscriptions are mild political theater. But shouldnt we expect a bit more from a person positioning them self to be mayor of one of the world’s great cities? In any event, car owners kvetching about parking, and Brooklyn and Queens residents hating bike lane’s are an NYC tradition long predating TA or Streetsblog. Remember Ed Koch and his separated lanes in Midtown? This wasn’t the first or last time Carey derided Koch for his bike ““fetish”. So, what was Carey’s problem? It’s said he was buzzed once by a guy on a bike. Annoying true, but how many times did Carey almost get hit by a car while crossing the street in his native Brooklyn? Never? Yet Carey never did a thing about dangerous drivers or for pedestrians. I can’t see why the CC just doesn’t jack up the property tax on Class A (1,2,3 family) home owners to Nassau County rates. After all, there are only 702,292 of them. A mere fraction; but they are motivated (not to mention their appreciative families). I can’t see why the CC doesn’t put a real property tax on all private vehicles owners, like they do in Connecticut. After all, there are only 3 million of them, a mere minority; but they are motivated (not to mention the appreciative people in the passenger seats). Of course, you must factor in that not everyone, but almost everyone, old enough to have a driver’s license has one. I think we can leave the children out of this. On another note: If the City of New York were to allow the muni-meter receipt with its recorded date-and-time as a defense for a summons with the same date and a later, or similar, recorded time, we could resolve this. A similar situation exists with the ‘fast meter’ defense. No appearance needed; everything through the mail. Available parking (the combined total of BOTH on-street and off-street parking) should be inversely proportional to the density of public transit. I can understand the need for some parking in the far flung reaches of Queens or Brooklyn or Staten Island. I’m failing to understand the need for any parking at all for private cars in most of Manhattan. Every place in Manhattan is fairly accessible by public transit. Moreover, in most cases public transit is faster than driving. Therefore, private autos are simply a needless luxury, not a necessity. Anyone who can’t use public transit for whatever reason can take a cab or paratransit van. The simplest way to reduce auto use is to get rid of parking. The only question prior to getting rid of parking should be do cars fulfill a necessary transportation function for the majority of people in any given area which can’t be accomodated any other way? If the answer is yes, then keep the parking. If not, get rid of it. Most of NYC was built and functioned just fine prior to the advent of the auto. It can learn to do so again. As Larry said, most available space has been turned over to cars and it still isn’t enough. If anyone is really so in love with driving, well, there are still plenty of places in the US willing to accomodate them. NYC shouldn’t be one of them. JK: Hugh L. Carey lived on PPW. He sold his house to Pete Hamill and moved into a co-op also on PPW(Check this out: same building as Senator Schumer). Now, leave him alone; he lost two sons in a car crash in 1969. Eight mentions for parking and lengthy description of her parking plan. My councilmember’s legislative aide told me that the media prefers to report on parking stories, which I would assume makes it a more attractive theme for legislation. Well, instead of these “mild measures” she could have gone for some big ones. Resident-only parking permits for parking overnight on the street, in areas that vote to have it in a referendum. Only those cars registered and insured in the area qualify. A $10 per month fee for those who are there now, increased by no more than the inflation rate. In areas where voters declare a “parking shortage,” additional permits can only be issued when old ones are surrendered — and those are auctioned off at market rate. They might even allow a few old ones to be surrendered without issuing new ones just to loosen things up in the worst places. All the money raised is kept in the neighborhood, through something like a BID. The city would maintain its own sidewalks, rather than asking property owners to do it, and the “alternate side” signs would be electronic. Alternate side would be once a month, announced a week in advance on the signs. Potholes would be filled immediately, regardless of what happens to the rest of the city budget. Now there is a proposal. For a mere $10 per month, you have assurance that more and more people won’t try to park in your neighborhood. Sorry, Christine, you can’t pay lip service to encouraging public transit use and then advocate for policies that make driving more attractive. 65 dollar short on your rent? No problem: sell your car and ride the bus like the rest of us working stiffs. If I could walk 3 kilometers every day across the park, or take the crosstown bus if it showed up on time, then so can some schlub in Little Neck who thinks people in Manhattan aren’t real New Yorkers. I’d like to point out that Quinn’s Manhattan council district contains the third-highest percentage of households without a car. PDF) In the 2000 census, 80.8% of households had no car. The majority of households citywide have no car. From the standpoint of sustainable transportation, this woman would be a disaster as Mayor. This is the point when I ask what percentage of registered voters are drivers and/or car owners? Everyone seems to know that a majority of households in NYC don’t own cars but no one ever answers the above question. I suggest that Ms. Quinn, Mr. Weiner and Mr. Weprin all know the answer. Or at least they’ve made the same guess as you, Nico. Unfortunately, I can’t think of a single New York politician whose election loss can clearly be attributed to disrespecting transit riders. Joe R, your proposition only makes sense if we believe that nobody ever needs to travel outside of NYC by anything other than train, Greyhound, or, perhaps, horse and buggy. “…areas that receive the highest cleanliness rating for two years in a row will have the option of one less day of alternate side.” And then if the cleanliness ratings go down, the neighborhood is going to go back to street cleaning twice a week? I doubt it. Inertia and public outcry will more likely lead to the change being institutionalized. But let’s say I’m wrong; what is the cost of changing all those signs every few years? Unfortunately, I can’t think of a single New York politician election loss. Firstly, sensible progressive is right. Alternative transportation advocates are doing more harm than good by railing against any policy change that makes driving and parking in NYC easier. But if Christine Quinn really wanted to bring about meaningful change, she needed a much more sweeping proposal instead of the patchwork and piecemeal proposal she has laid out. Firstly, as for street cleaning, the city needs to study how, where, and when to clean its streets. This it has never done. Instead, the regime in place seems designed to provide employment to broom operators who operate machines that barely do what they are supposed to do – clean the street. The notion that people have to move there cars, and sometimes sit in them for hours, just so that a mechanical broom can push the dirt from one place to another seems ridiculous. There needs to be a reexamination of the need for ASP regulations in many of the less urban parts of the city. Next, discretion needs to be returned to traffic agents so that they may cancel tickets they start writing when they realize they were mistaken in writing them. The reason this rule was adopted was to make it more difficult for traffic agents to take bribes. What it has done is it has created a situation where traffic agents frequently turn in parking tickets, affirmed to be true under the penalties for perjury, that the traffic agents know to be false. Traffic agents are committing misdemeanors everyday in this city by turning in parking tickets when they know that the motorist was not in violation. “You can fight it” is not a satisfactory solution. Moreover, the city must change the culture in the NYPD and its traffic division that imposes parking ticket quotas, or whatever you want to call them. The reason so many bogus parking tickets are issued is because there is pressure on issuing agents to meet productivity standards, and advancement in the agency is gauged on performance (measured only by the number of ticket written, and not on the number sustained). Then there is the biggest thing that needs to change: the Parking Violations Bureau must cease taking orders on how to decide parking tickets from the lawyers who work for the the Department of Finance. DOF lawyers make decisions on what the rules of decisions should be in parking ticket adjudications, and the cowed administrative law judges do as they are told if they want to continue getting hours. Essentially, the hearings are rigged in favor of the City in a manner designed to maximize revenues. I can name ten rules of decisions that fly in the face of state law and the common law, but that PVB ALJs follow because they are told by their bosses to decide cases that way. Last but not least, I must comment on the people here who contend that it is nonsense that almost every New Yorker has a story about an unjustly received parking ticket. I have a client who receives one unjustly received parking ticket every month. The only explanation that we can fathom is that she is targeted because she has a disability parking permit and she receives the tickets while parked where most may not, and the issuing agent claims not to have seen the prominently displayed placard. You folks who don’t believe it need to get out more. I think most of what you have to say, along with the bulk (if not the focus) of Quinn’s proposals, are fair and balanced. We should not be opposed to better government, even if it only benefits car drivers. However, I find it hard to believe that “almost every New Yorker has a story about getting tickets they clearly didn’t deserve”, given that most new yorkers don’t even own a car. Unless you are claiming that even those who have no access to a car are somehow getting tickets. Now, if you wanted to say that almost every New Yorker has heard a story about an unjust ticket, well, I’d certainly buy that. Well over half the people in NYC don’t own cars. Most of those who do don’t use them to go to Manhattan. Yes, a car is useful if you’re going someplace not served by public transit. Manhattan isn’t such a place, hence no need for private cars there. There are plenty of park-and-ride stations suburbanites can use to come in. Outer borough residents can and usually do use the subway. If Manhattan residents are going someplace they need to take a car to, it probably makes more sense to take public transit as close to the final destination as possible, then rent a car from there. Driving/parking in Manhattan stinks anyway. You would probably make better overall travel time following the suggestions I made. Fair enough, Nathan. But there’s a whole city out there beyond Park Slope. Now That Parking Is Played Out, Will the Council Tackle Traffic Violence?